Hooray! I played Wii Sports for 30 minutes. I actually got up off the couch and exercised! I played two games of 9-hole golf. It was actually fun, so I can see myself playing it again. I tried the boxing, but didn’t feel anywhere near a pro. So, I thought I’d try working out 60 minutes a day, 5 times a week, for 6 weeks. That lasted one day. I then changed it to 30 minutes a day, but still didn’t exercise until yesterday. I’ve definitely been what you’d call a couch potato. I got the idea from the President’s Challenge for fitness, but I thought I’d keep track myself on a calendar I made at home. Plus, I was trying to stick with my traditional, serious exercise routines, such as jogging. When you check out the President’s Challenge website, you can sign up to keep track of your fitness online. 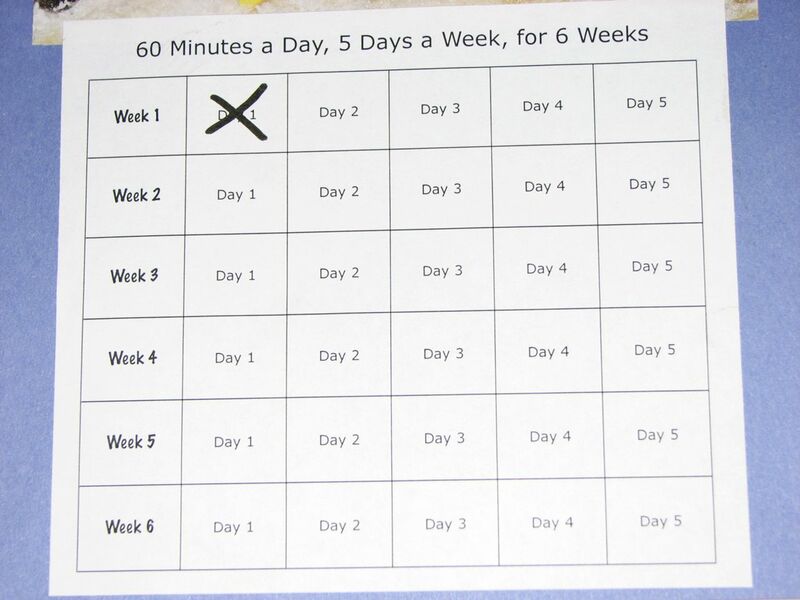 You can also print out an activity log so that you can keep track of your exercise on paper and then log it in once a week. There’s a list of activities that include mowing the lawn, doing housework, and playing Nintendo Wii (sports). 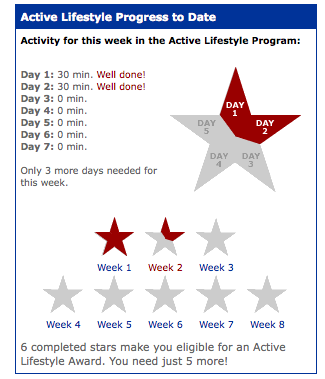 Please note that I’m doing the Active Lifestyle Challenge, which is the six weeks of 30 minutes a day. The Champions Challenge is for people who are already active. With that, you get points for the activity you do. Yesterday, I played sports on the Wii and enjoyed getting beaten at tennis and seeing how awful I was at baseball. I think I can play the Wii for 6 weeks. I decided to go ahead and sign up to keep track of everything online. I logged in yesterday’s 30 minutes, and it even asked if my Wii playing was light or moderate. 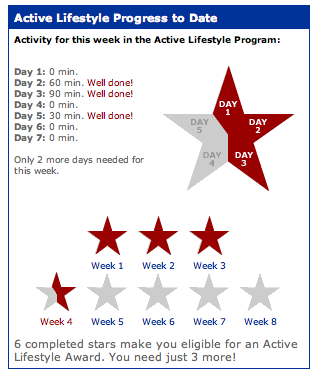 There was a star visual, divided into five pieces, one for each of the five days you’re to exercise each week. After I logged my activity, one part of the star was shaded, and that was a cool visual for me. I’m very visual, so maybe that’s what I needed. Plus, you can’t go wrong with playing video games every day. So, I’m going to go play Wii for 30 minutes, log my time, and see if I can keep this up for the rest of the week. The past two days, I haven’t exercised. I’ve even been avoiding it today as well. I think it’s the 60 minutes that’s been holding me back. I’m going to change it to 30 minutes a day, 5 days a week, and we’ll see how that goes. I may end up changing it to 15 minutes, but we’ll see. When I was doing Level 2 of the Navy Seal Jogging Plan, I was able to handle the workouts. When I got to Level 3, I stalled. I don’t think my body was ready for 3 miles a day. I tend to run half a mile before a break feels like a really good idea. To be honest, I wonder if I’ll get past a week. Here are some pics of the workout calendar I made. 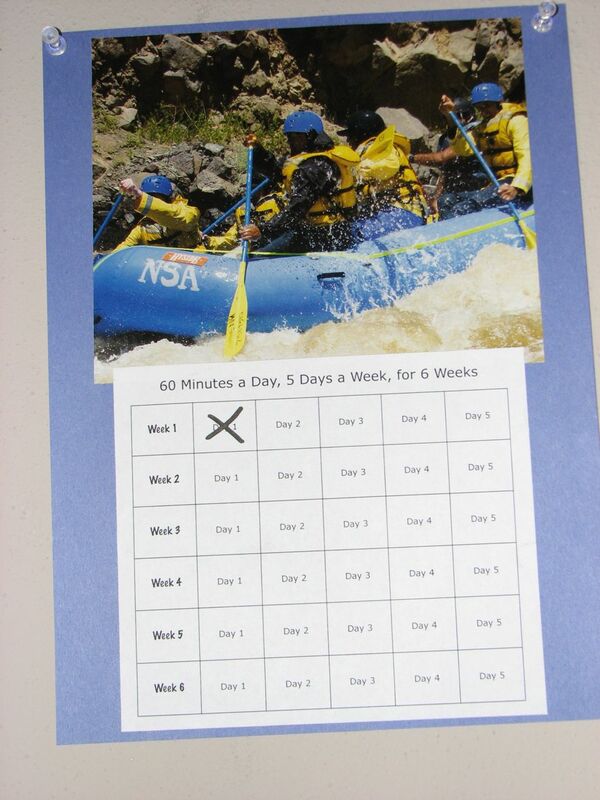 The river rafting photo is from a New Mexico travel guide. Today, I did a fitness evaluation on My Fitness Coach (Wii), which took about 15 minutes and was a workout in itself (push ups to exhaustion, etc. ), and then did a 45 minute workout with an upper body focus (also My Fitness Coach). It started with cardio, including some step work, and then went into strength work (no weights today). The hardest part was when it wanted me to balance my feet on a balance ball and do push ups. For the record, I am not one with push ups at this time. It also took me forever to actually get my feet on the balance ball. There was definitely a lot of falling onto the floor.